There, now I feel better, it’s out there. I’ve gone road hunting in CJ’s that still hurt my back, but it was still fun! 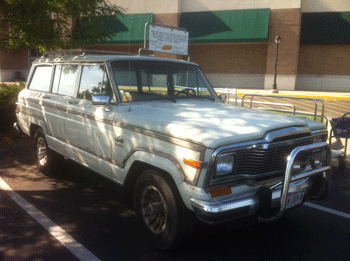 I have owned a 1986 four-door Wagoneer (XJ), then a 1996 Grand Cherokee (ZJ), a Liberty (KJ). Designed by D iamler at the time and not my favorite because it was way to top-heavy as you can see here after an Illinois driver on his cell phone clipped me. I walked away. It’s the only vehicle I have exited through the sun roof. We currently area about to purchase our 2011 Wrangler Unlimited (JK) off our lease and I can’t wait to start making it more our Jeep. First thing I’m going to do is put a cold air intake to give it some zip. I have been to Camp Jeeps at both the Chicago and Milwaukee auto shows. Milwaukee was the better ride. Check out the videos from my rides. Yup, all in. It was when American Motors, where my dad worked, bought Kaiser’s money-losing Jeep operations in 1970 that I started to dig into the history of the Jeep brand. AMC was hurting at the time and this was a big gamble for them but the Jeep utility vehicles complemented AMC’s passenger car business. Actually it saved the company. AMC was able to share components, achieving volume efficiencies, as well as capitalizing on Jeep’s international and government markets. 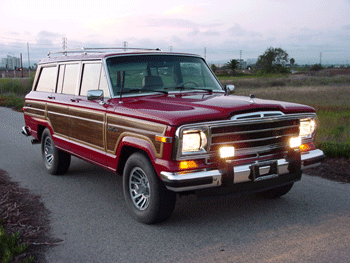 The four-door Jeep Wagoneer (SJ) set the pace as it was the first luxury 4×4 sold and produced from 1963 to 1991, nearly 30 years before the term SUV was in vogue. 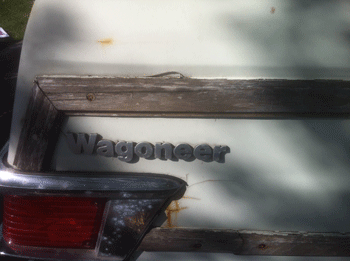 Compared to what GM, International Harvester, and Land Rover were offering at the time, it was the Wagoneer’s luxury that set the bar. Adding to success of the Wagoneer, and it’s two-door version Cherokee AMC introduced in 1973 was the Quadra-Trac full-time four-wheel-drive system which attracted even more people to Jeep products who wanted four-wheel-drive traction without the inconvenience of a manual-shift transfer case and manual locking hubs. The Wagoneer Limited you see in these images which later morphed into the Grand Wagoneer, had the whole deal, deep pile carpeting, advanced overhead cam inline six and then later a monster AMC 401 V8 engine, auto transmission, power windows, a/c, power steering, power brakes, an independent front suspension and yes, real wood outlining the fake vinyl wood as you can see in this example which I think is a 1981. 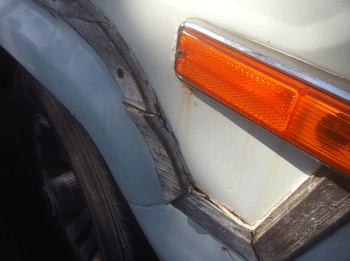 It’s a little on the rough side but there are lots of places that specialize in full restorations like GrandWagoneer.com. The vehicle still has a following even though the last Grand Wagoneer rolled off Chrysler’s Toledo assembly plant on June 21, 1991. 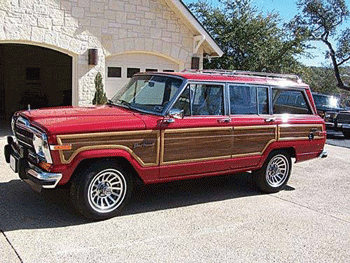 Now that Fiat owns Jeep there were images floating around showing a modern version of the Grand Wagoneer which I have heard won’t come on the market for another couple of years. 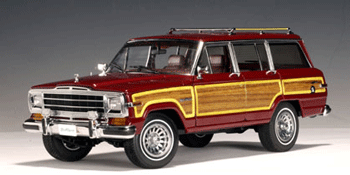 I would love to have a Grand Wagoneer to show off to the people I know who drive Cadillac Escalades or Range Rovers. Sure buddy, one on one! I made a trip to one of my favorite sites, Hemmings, and found Grand Wagoneers from the mid-20’s to all the way up to 50 grand like this one. Have you looked at the current prices of the Caddy or Rover? So what if you don’t have the cash? 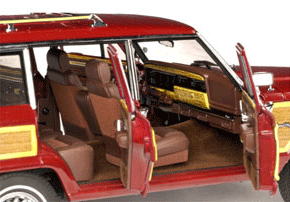 Surprisingly with such a long run, you’d thing there would have been a promo model made but it never happened, however this Grand Wagoneer produced by AutoArt is a great alternative. I picked up this 1/18th scale diecast about five years ago for around $100. Even though AutoArt has stopped producing them, they pop up on eBay except for the white one which is nearly impossible to find. Check out the details on this. 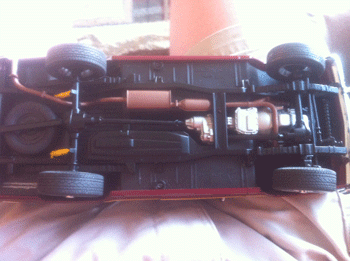 All the doors open, along with the hood and rear lift gate. 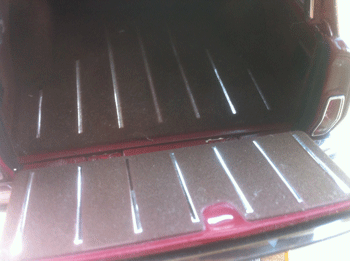 The interior has real carpeting and upholstery. 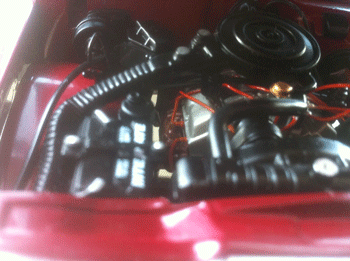 Check out the engine bay. I love looking at this. I keep hoping that someday there will be a way to take it and scale it up into the real deal.